On Wednesday, January 9, it was an honor to be sworn into office for a fourth term in the Illinois General Assembly. The House of Representatives of the new 101st General Assembly includes 74 Democrats and 44 Republicans, and I will continue to represent approximately 108,000 residents from Ogle, Lee, DeKalb and LaSalle Counties. During the inauguration ceremony, Representative Mike Madigan (D-Chicago) was re-elected Speaker of the House and Representative Jim Durkin (R-Western Springs) was re-elected House Minority Leader. In his remarks to the newly-convened House, Leader Durkin pledged to uphold Republican principles and to work together with newly-elected Gov. J.B. Pritzker whenever possible for the good of the State of Illinois. 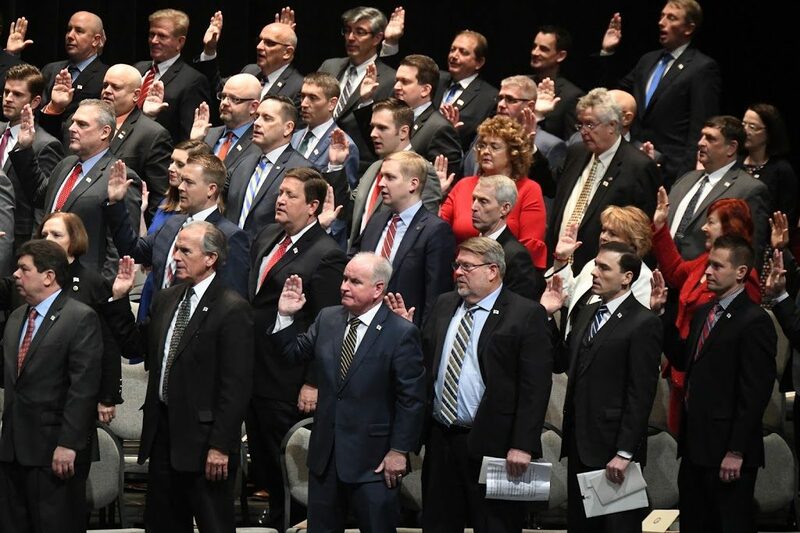 Within our caucus, 13 new Republican lawmakers took the oath of office and joined the ranks of the freshman class of the 101st General Assembly. Click here to learn about the new members of the House Republican Caucus. I am in the process of finalizing a comprehensive 2019 legislative agenda that focuses on improving access and delivery of health care services, protects taxpayers, eases consolidation processes and improves government operations. I welcome your input and suggestions. If you have an idea to share, please do not hesitate to contact me via email at tom@tomdemmer.com, or by phone at (815) 561-3690. You can learn more about my legislation by visiting www.tomdemmer.com. House Republican Leader Jim Durkin has announced the appointment of State Representative Steve Reick to the Joint Committee on Administrative Rules (JCAR), a bi-partisan, bi-cameral legislative oversight committee. Three House Republicans serve on JCAR, and Reick will join Representative Keith Wheeler (R-Oswego) and me on the Committee. The members of JCAR oversee the rule-making process by state agencies, making sure the rules abide by the original intent of legislators when laws are passed. The committee is composed of 12 legislators who are appointed by the legislative leadership, with the membership apportioned equally between the two houses and the two political parties. It is co-chaired by two members representing each party and each legislative house. The members of JCAR are also charged with making sure the General Assembly is adequately informed of how laws are implemented through agency rulemaking and facilitating a public understanding of rules and regulations. During the first part of Fiscal Year 2019, the fiscal year that began on July 1, 2018, revenues increased and Illinois was able to begin to chip away at the more than $7 billion in unpaid bills that burden Illinois health care providers and other creditors. This revenue growth curve flattened in December 2018 as existing taxes ceased to yield major net new revenue. Personal income tax payments to the State in December 2018, $1,577 million, exceeded the year-earlier figure by only $7 million, an annual growth rate of 0.4%. The flattened growth curve indicates the consequences of the failure of Illinois’ economy to generate a significant number of net new jobs. While other states such as Florida and Texas are creating large numbers of new jobs, Illinois is not doing so. In the past, I have had a great response to my “Rich History of the 90th District” photo contest. I am sponsoring this contest again this year and will accept entries through 6:00 PM on Friday, February 8. Contest participants should submit their photos of historical sites, buildings and landmarks that highlight the rich history of the district and our region. Click here to view a map of the 90th District. Particpants may submit as many entries as they would like before the deadline of 6:00 PM on Friday, February 8. Please include a name, phone number and location where the photo was taken with each entry. Entries should be emailed to photos@tomdemmer.com. I will choose winning entries and invite photographers for a photo and unveiling at my district office or in Springfield. If you have questions about this contest, please call my office at (815) 561-3690. Good luck! A new law, SB 3549, sharply increases regulatory controls over underground aquifers and nearby geological strata used to store natural gas. The storage facilities serve as gigantic batteries that can be used to generate electricity on demand. A sharp movement in Illinois power generation, from coal-fired electricity to power generated from natural gas, has led to the construction and expansion of these facilities within state lines. Under the bill, signed into law as P.A. 100-1172, the Illinois Department of Natural Resources (which regulates underground caves and mines) and the Illinois Commerce Commission (which regulates electricity and gas) will work with the U.S. Department of Transportation to ensure that all underground gas storage facilities in Illinois meet federal minimum safety standards. This will help protect aquifers and sources of groundwater used by hundreds of thousands of Illinoisans. The new measure was signed into law on Friday, January 4. The “lame-duck” session met earlier this week prior to the inauguration of the new 101st General Assembly. The House passed a bill to create a changeover in the membership of the Illinois Toll Highway Authority, the often-controversial board with executive responsibility over the toll roads of northern Illinois. SB 1298 will end the terms of the nine members of the Toll Highway Authority, allowing the new Governor J.B. Pritzker to make appointments to fill the vacancies.